The story of aviation in the United States usually begins with the Wright Brothers and their famous flight at Kitty Hawk, North Carolina, in 1903. Yet the Wrights, though they were the first to successfully test a flying machine, are only a small part of the story of the development of powered aircraft. New York State was actually at the center of aviation pioneering in the years between 1908 and 1929, with developments concentrated first near Keuka Lake, then on Hempstead Plains. This period of aviation history highlights New York as a center of innovation, leadership, competition, and capitalism. The first name in New York aviation was Glenn H. Curtiss of Hammondsport New York (Steuben County) in the Finger Lakes region of the state. Curtiss became known as “The Fastest Man of Earth” in 1907, when the “Hercules” motorcycle he designed, built, and raced set a speed record of more than 136 miles per hour. By 1908, Curtiss had moved from motorcycles to flying, and began testing his planes by taking off on the frozen surface of Keuka Lake. 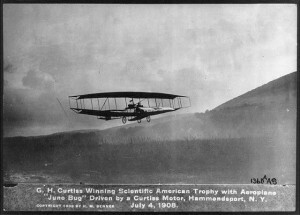 When Scientific American organized a three-part contest that year, Curtiss set out to win all three competitions. “On July 4, 1908, the publication’s editors, along with members of the Aero Club of America traveled to the tiny hamlet of Hammondsport, N.Y., to witness the first pre-announced, public flight of an aircraft in America, the ‘June Bug,’ which won the first leg of the three-part competition” by flying in a straight line for 1 kilometer (.62 miles). Although the Wright brothers had preceded Curtiss’s flight by several years, his was the first scheduled, publicized test of an airplane. The following year Curtiss flew 25 kilometers (15 miles) in his “Golden Flyer” biplane to win the second stage of the contest. Finally, in 1910 he won both the third leg of the Scientific American competition in “The Albany Flyer,” which he piloted from Albany to New York City. Curtiss not only designed and flew his planes, but built the special high-powered, water-cooled V-8 engines that ran them. Wright Brothers as well as Curtiss and international flyers. New records were set for altitude (more than 8,000 feet) and speed (68 miles per hour). 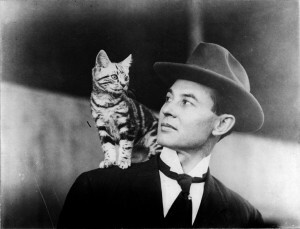 The premiere event was a daring race from Belmont Park, around the Statue of Liberty, and back, watched by 150,000 spectators at the field and perhaps a million more on the streets of the city, and won by American John Moisant – accompanied in flight by Mademoiselle Fifi, his cat. Women broke into flying almost immediately. Bessica Medlar Raiche and her husband, Francois, built a plane at home in Mineola, experimenting with lighter materials. When Bessica, a feminist, athlete, and dentist, flew their machine, she was recognized as the first woman to fly solo in the United States. 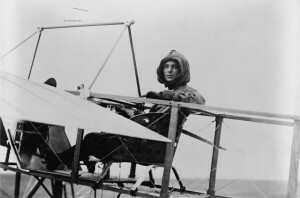 However, historians now believe that Blanche Stuart Scott of Rochester, a pupil of Curtiss’s in Hammondsport, actually piloted her plane alone earlier that year – though only accidentally when it was lifted by a gust of wind. In 1911, Harriet Quimby, a journalist, became the first licensed woman pilot in the United States after taking a five-week course at the Moisant School in the Hempstead Plains Aerodrome (run by John Moisant’s brother Alfred). Matilde Moisant, sister of the school’s proprietor, was the second woman to be licensed. Hempstead Plains became home to airplane manufacturing companies as well as flying schools and path-breaking flights. During World War I, army aviators trained there, including Quentin Roosevelt, son of former president Teddy. After Quentin died in a crash, the field was named Roosevelt Field in his honor. Glenn Curtiss continued to invent new flying machines for military use, such as the Curtiss “Jenny” trainer for the army and the Curtiss Flying Boat for the navy, which was tested in Huntington Bay. The Curtiss Company plant in Garden City was the largest manufacturer in the area, but other companies built planes in Farmingdale, College Point, and Queens. After 1921, Curtiss himself lost interest in building planes, but the Curtiss Aeroplane and Motor Company continued to be the largest manufacturer of airplanes in the United States, merging with a company formed by his earlier rivals, the Wright Brothers, to form Curtiss-Wright in 1929. In 1918, aviation entered what is now considered its “Golden Age,” and Long Island was at the forefront of record-setting. The most famous flight from Roosevelt Field was, of course, Charles Lindberg’s 1927 journey from New York to Paris in the Spirit of St. Louis. Less well known is the 1928 exploit of Elinor Smith, “The Flying Flapper of Freeport” who “became the first, and only, pilot to fly a plane under all four of the East River bridges in New York City” at the age of 17! 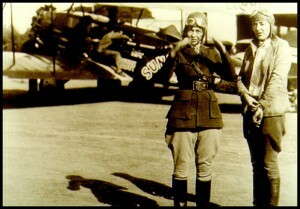 In 1929, the “Ninety-Nines,” a group of 99 women pilots, was formed at Curtiss Field in Valley Stream, with Amelia Earhart as the first president. Long Island and Hammondsport are not the only regions of the state to recognize their history of flight and aircraft development and manufacture. In addition to the Cradle of Aviation Museum in Garden City and the Glenn H. Curtiss Museum in Hammondsport, New York State has numerous museums devoted to aviation history. From the Lucile M. Wright Air Museum in Jamestown, to the Old Rhinebeck Aerodrome Museum in the Hudson Valley, to the National Warplane Museum in Geneseo, the National Soaring Museum in Elmira, the Empire State Aerosciences Museum in Glenville, and the Niagara Aerospace Museum in Buffalo, New York preserves its heritage as a leader in flight. Yet I suspect that most New Yorkers have little sense of the central role our state played in aviation history. One final connection— after LaGuardia airport opened in 1939, and Idlewild (now JFK) in 1948, Roosevelt Field was no longer as necessary for flight, and eventually closed in 1951. The property was then developed as suburban shopping mall, designed by I.M. Pei (later a world-famous architect who designed the glass pyramid entrance of the Louvre Museum in Paris) and opened in 1956. Expanded several times, Roosevelt Field is still a popular shopping destination on Long Island, the eighth largest mall in the United States and largest in New York State. Joshua Stoff, From Airship to Spaceship, Long Island in Aviation and Spaceflight, Empire State Books (New York), 1991, p. 35. This entry was posted in Finger Lakes, Long Island, New York City, Western New York on October 10, 2013 by Susan Lewis.